This Kolad river rafting package gives you a fun-filled day of adventure in the green environs of Kolad. You'll enjoy a thrilling 2-hour session of rafting on the river, and then you'll try your hand at the bumper ride and kayaking. Here, surrounded by greenery and cool breezes, you'll feel like you're miles away from the city. This trip is ideal for a quick getaway as it is easily accessible by road from Mumbai and Pune. NOTE: For this Kolad rafting trip, you will not have any accommodation, but you'll have access to changing rooms and bathrooms. IMPORTANT: Travellers need arrive at the rafting start point by 08:30 hrs. After your rafting session, you can proceed to the campsite. Kolad is a small town in the Konkan region of Maharashtra, right along the Kundalika river. Every morning, the massive Bhira dam opens its gates to release water for agriculture, turning the river into a rushing force of nature. You'll have a thrilling rafting in Kolad along the rapids for two hours, amidst lush green fields and swaying coconut palms. • Try kayaking and go on a bumper boat ride. Travellers are required to adhere to guidelines of the rafting instructors while rafting in Kolad. 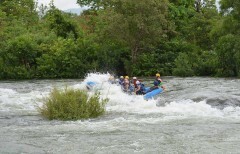 For cancellations made 7 days or more before departure of this Kolad rafting trip: 100% refund. For cancellations made 4-6 days before departure of this Kolad rafting trip: 75% refund. For cancellations made 3 days before departure of this Kolad rafting trip: 50% refund. 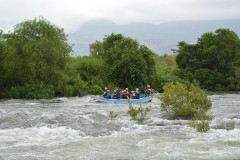 For cancellations made 2 days before departure of this Kolad rafting trip: 25% refund. 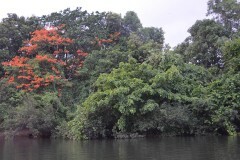 For cancellations made less than 2 days before departure of this Kolad rafting trip: No refund. Children younger than 14 years of age are strictly prohibited from rafting in Kolad. The tour operator takes utmost care to ensure safety of the travellers and shall not be held responsible for any mishap, accident or loss of life while rafting in Kolad. The tour operator reserves the right to cancel or alter the itinerary of the trip to ensure maximum safety for travellers as well as staff. Kolad river rafting + water activities: Adventure day! You have to report at the rafting start point by 08:30 hrs. You'll head directly for your rafting trip. After a fun 2-hr rafting session which includes jumping into the river for a quick swim, you'll have to book a tum-tum (not included in the package) back from the end point. A hot lunch is waiting for you at the campsite. Dig in, and then try your hand at the other activities: bumper boat ride, and kayaking. You'll stop for tea and snacks in the evening. After that, by 17:00 hrs, it's time to check out. Trip ends here. All equipment required for rafting: inflatable rafts, life jackets, paddles, helmets etc. You'll be completing your rafting activity session before you go to the campsite. After this, you'll stop for lunch, before moving on to other activities. Apart from this, you will also get tea and snacks in the evening. Check-out time is 17:00 hrs. Trip ends here.